Has anyone within the last year taken the overnight train from Ho Chi Minh to Da Nang or the train from Hue to Hanoi? Have been discourage by all of the negative reviews about this mode of travel. Hubby and I were planning to book a soft sleeper. Would appreciate hearing about your experience. Thank you. Yup! I caught this train, a month or so ago from Ho Chi Minh City to Hue and to be honest I can't imagine how I could complain about it! I had a soft sleeper four berth cabin, shared with three Vietnamese travellers, and slept reasonably well. The train was very clean (tho one of the toilets blocked up and got pretty vile) there was plenty of food and drink and the trip, especially between Da Nang and Hue was stunning. Would absolutely recommend if you have the time. What sort of things are people complaining about? Thank you for your reply somtam2000. I appreciate reading about your positive experience as we had hoped to utilize the train and take a break from flying. The complaints were about how dirty the train was with filthy toilet facilities. Men without tickets attempting to take a bed in the sleeper cars and hanging outside these cars smoking and talking all night making it impossible to sleep. The bedding between passengers was reused multiple times and folded up to make it look as though it had been laundered. The A/C was on either full blast so one was freezing or not on at all so you were sweltering. Also mention of not feeling that the stowed luggage in the car was safe if they fell asleep. Questions for you if you don't mind? Do you use your own sheet and pillow case? Can we purchase these in Ho Chi Minh prior to taking the train? Are there any cars on trains from Ho Chi Minh with two beds? Should stowed luggage be chained together or locked to the berth? Can passengers smoke freely on these trains? I went through each of your points. Hope this is of help. 1) The complaints were about how dirty the train was with filthy toilet facilities. Train was generally spotless. As mentioned above one toilet was blocked and got pretty ugly, but the other toilets were fine. 2) Men without tickets attempting to take a bed in the sleeper cars and hanging outside these cars smoking and talking all night making it impossible to sleep. Saw nothing like this. Cannot recall seeing anyone smoking. Tickets were checked and had no issues. 3) The bedding between passengers was reused multiple times and folded up to make it look as though it had been laundered. My sheets and blanket appeared to be clean. 4) The A/C was on either full blast so one was freezing or not on at all so you were sweltering. Temp was fine, with little to no variance. 5) Also mention of not feeling that the stowed luggage in the car was safe if they fell asleep. I only had a fairly small pack so it laid on the bed with me. Other pax in my car routinely wandered off leaving their luggage unattended. I didn't see anyone chaining up bags. 6) Do you use your own sheet and pillow case? 7) Can we purchase these in Ho Chi Minh prior to taking the train? No idea, but as I mentioned above, I thought the linen was fine. 8) Are there any cars on trains from Ho Chi Minh with two beds? I don't know, would cost more if so. 9) Should stowed luggage be chained together or locked to the berth? I guess that would be prudent, but I saw nothing like that happening. The three other pax (all locals) did not know one another and left their stuff all over the place. They also routinely gave me fruit and snacks! 10) Can passengers smoke freely on these trains? I didn't see anyone smoking on the train. I'm not sure what the actual rules are. I appreciate the time you took to respond to my lengthly post on night trains in Vietnam. Very helpful, thank you somtam2000. I live in Vietnam and only use the train when I have no other option, but long distances are another reality. Beware! The train I caught was the SE4 from HCMC to Hue and yeah, aside from the one blocked toilet I mentioned I would describe it as spotless (at least within a Southeast Asian context! 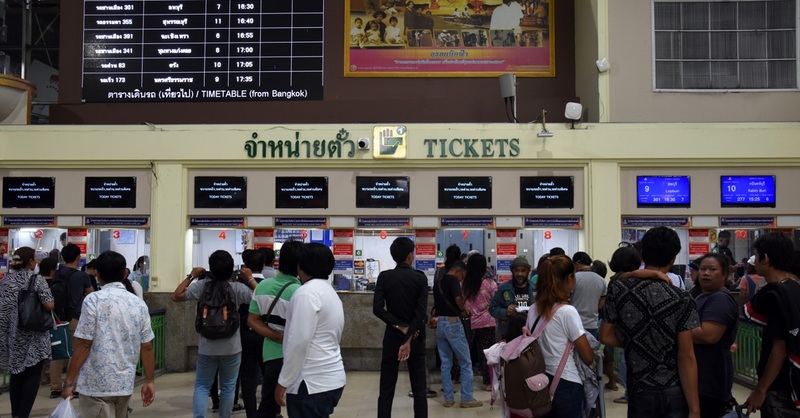 )—certainly on par with a sleeper train running say Bangkok to Chiang Rai or Bangkok to Surat Thani. It is a long trip, we left HCMC at 19:45 and arrived in Hue around 15:30, but half the trip was at night, so I slept through almost half the trip. As far as beauty/boring goes, this is pretty subjective, but I woke at dawn as we were cruising right beside the coast near Whale Island north of Nha Trang and it was simply stunning. Later, the leg between Da Nang and Hue is routinely described by many (not just us!) as one of the most beautiful train trips in Southeast Asia. But yes, opinions will vary. If time is limited, flying is obviously far faster and, with advance booking, probably cheaper.